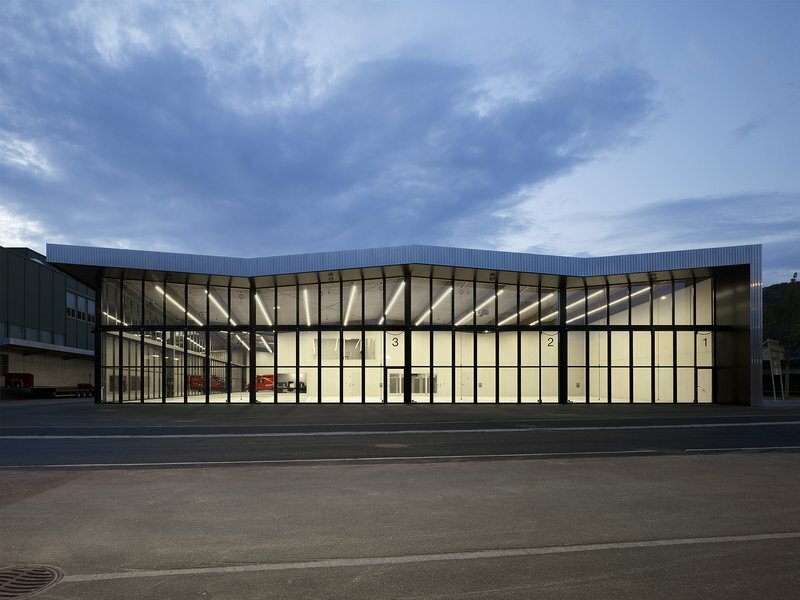 The new fire and rescue centre for the town of Weinfelden in the canton of Thurgau combines the previously separate headquarters for the fire and rescue services under one roof. 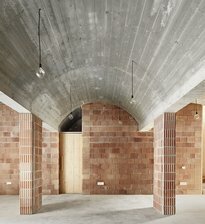 Placed on a triangular plot, the building sets an urban accent at the entrance to the town and marks the interface between industrial and residential areas. With a stepped volume on one side, it echoes the small scale of the neighbouring homes, while a generous glass front on the other side allows it to blends in with the nearby row of commercial buildings. The basis for the design is a stringent support structure. The roof is divided into ten inclined areas that reflect the layout of the floor plan, with an L-shaped vehicle hall enclosing the administration area, cloakrooms and theory rooms. Powerful steel girders allow for a column-free garage for flexible usage, while in the two-storey core area the roof rests on concrete walls. The core area and vehicle hall can thus be divided into different climatic zones. On the roof of the Minergie®-certified building is a photovoltaic system. The support framework and floor plan create an overall system which, despite its modular structure, responds coherently to the unusual shape of the plot and lends each of the three sides of the building a different, fitting character. 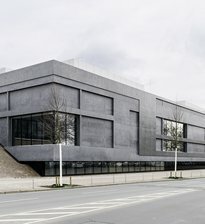 The trapezoidal sheet metal façade made of raw aluminium has an obvious industrial look, while on the interior concrete, steel, wood and rough cement particle board dominate.